Mario and friends return to the pitch for a no-holds-barred soccer game with Mega Strikes and items that assist the player. 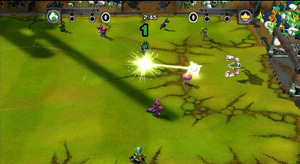 Two teams of five players challenge each other to gain possession of the ball, a metallic orb that changes colour as it is passed around the pitch. The brighter the ball gets, the more likely it is to hit the goal when an attempt is made. A Mega Strike can score up to 6 goals in a single attempt. You can play online Ranked Matches against random opponents from the same region of the world, or a Friendly Match against players who have exchanged friend codes.